Speak to industry experts who have been in the business for over 30 years. Enjoy educated and engaging tour guides that share their extensive knowledge of Australia's history, food, wine, art & the indigenous culture, that enables each journey to be personalized. Want to delve into the Australian culture? We can arrange authentic, behind-the-scenes experiences such as a private chef dinner, a yacht cruise of Sydney's Harbour, visiting a private sheep farm, or spending the day with a local historian for a private tour of Melbourne. Choose the Australia vacation style that you want. Honeymoon & romance packages, family trips, food & wine vacations, adventure travel, rail journeys & guided vacations, or we can create a custom, tailor made Australia vacation just for you. By avoiding tourist traps & having a focus on the local people & businesses, you will benefit the communities you are visiting. Our partners also support a range of projects and charities in Australia. Personally, you can offset your carbon footprint through ClimateCare. Escorted Australia tours include trips into the outback to stand in awe at the striking color changes of Ayers Rock at twilight, or admire the mystical domes of the Olgas. Discover an underwater world teeming with colorful wildlife on the Great Barrier Reef and be amazed by this unique natural wonder. Venture south to the Great Ocean Road to see the majestic limestone pillars of the Twelve Apostles jutting out of the sea. Or take an excursion to witness the famous mighty parade of Little Penguins on Phillip Island. While on any of the Australia travel packages below, you'll find that Australia's cities are just as captivating. 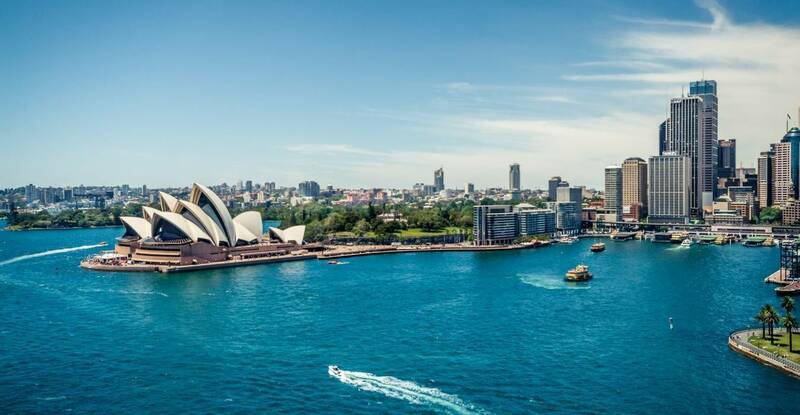 Sydney beckons with world-famous landmarks like the Opera House and Harbor Bridge as well as natural treasures like the beautiful harbor itself and magnificent surf beaches. Cuddle a koala, shop till you drop, dine in style or lose yourself in the city's art galleries, museums and theaters. Cosmopolitan Melbourne has a distinctive charm all of its own, with it multicultural cuisines, designer fashions, thriving arts community and rich colonial history. What is the best time to take an escorted Australia tour? When researching Australia tour packages, it's important to know that the seasons are opposite to ours, so for example, between December and February is summer in Australia. The winter there is from June through August but is usually mild. Lots of people like to avoid the heat and go in the Aussie winter. We like September, October and March for milder temperatures. Excellent and almost immediate service. Plus saved me more money than I anticipated. Brenda was fabulous always making sure we got what we wanted, and always in touch to make sure the experience was the best!! Over all the experience was positive and I would definitely use you and recommend you to friends and family. Carol was tremendous in her prompt attention to our vacation request. Due to circumstances out of our control, we are not able to join in on this tour. FOR SURE, we will use Carol in the future. Gabriella has helped me with reservations for 2 different trips. For both trips, she answered all my questions and concerns in a timely manner. She is always professional in her customer service, and her pricing of my trips were excellent. Because of this, I will continue to use Atlas for all my future trips. The Atlas Group makes your traveling/cruising experience effortless. It was very easy to contact them whether by phone or email you would always get a response within (1) business day or less. I am very pleased with Atlas travel and will continue to use them going forward for many travels in the future. Is visiting the Great Barrier Reef on your bucket list?